The Wine and Cheese Place: Still 630 Arkham's Opus Still Modern Whiskey. Still 630 Arkham's Opus Still Modern Whiskey. We’re releasing Batch 2 of StilL Modern (our Brewery Collaboration with Modern Brewery), however we turned it up a notch for this batch. 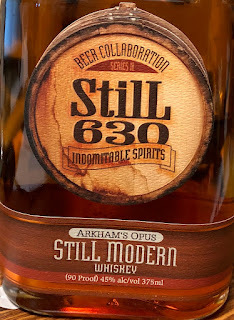 We took that delicious StilL Modern whiskey and finished it for another five months in the Opus One wine barrel Modern Brewery used to age their Arkham’s Finest (chocolate/coffee stout) to create Arkham’s Opus.